Our Brand New Winter Program Begins Next Month! Summer tennis at five public housing developments in Bed-Stuy. Check. After-school tennis at Marcy Playground. Check. Indoor Winter Tennis at Pratt Insitute...? Check! 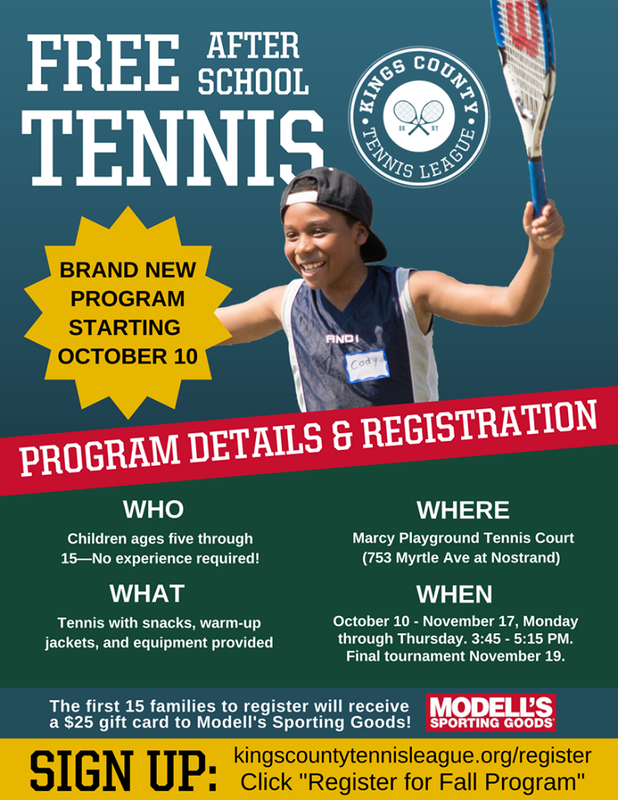 In line with our effort to make tennis available to the kids year round, we are proud to announce the establishment of a brand new Winter Tennis Season based at Pratt next month. We will continue to teach and reinforce the fundamentals of tennis, develop individual strategy on the court, and introduce specialty shots such as drop shots and lobs. The eight-week program begins Saturday, February 4 and ends Saturday, April 1 with a day off for Presidents' Day Weekend, February 18. Six of the Saturdays will be actual tennis classes at Pratt, while the other two will be field trips to inspire unique learning opportunities, much like our past trips to Google and Made in Midtown Shoe Factory. Following exceptionally strong youth interest, enrollment is closed. Volunteer space remains open. If you are 16 or older and available for four or more sessions, you can register to volunteer here. We're Going to Arthur Ashe Kids Day on August 27th! After a summer of bringing tennis to the kids, we are bringing the kids to the home of the best tennis in the country! All KCTL students are welcome! Click here to register your child. KCTL Parents/Guardians and Volunteers are invited to accompany us as chaperones. Fill out a form to join us. There will NOT be normal Saturday class on this day. WHAT IS ARTHUR ASHE KIDS DAY (AAKD)? AAKD is an annual grassroots tennis and entertainment event held immediately before the start of the U.S. Open. Expect an incredible day of interactive tennis activities, watching tennis pros practice, a live concert, and more! Food will be provided. Meet at your regular KCTL site by 9:00 AM for subway departure at 9:20. For our trip home, we'll congregate at Practice Courts 3 & 4 at the Tennis Center shortly after 3:00 PM. We will return to our home sites between 4:00 and 4:30 PM. No food is allowed inside the USTA grounds. Please do not bring racquets, and avoid bringing bags if you can. Educational Coordinator Ari Fulton from Lafayette Gardens is so proud that her students took home the gold at this year's Davis Cup. The team not only demonstrated stellar athletic ability on the court, but showed true sportsmanship toward all players. In her August 6 off-court discussion, Ari continued the conversation on cognitive awarenesswith an introduction to grit and resilience. The discussion focused on emotions—specifically anger. Three adult volunteers acted out different reactions to missing a return swing in a tennis match. One person acted violently, one yelled, and one passive-aggressively refused to continue the game. Though the kids easily recognized that the skit was meant to encourage them to control their anger, Ari and her students were still able to enjoy a meaningful conversation. Once the laughter over the volunteers' bad acting subsided, one student, Jayden, shot his hand eagerly into the air. In that very moment, he connected the skit to an incident in his own life. Jayden explained that he and another boy, Damian, had gotten into an argument about missing a shot during Davis Cup. Together, the class talked about the argument, and the boys problem-solved ways to communicate more effectively. The objective of the lesson was not to never be angry, but to think about ways we can use our words instead of actions to express our anger. Thanks to the extra warm summertime weather in Bed-Stuy on Saturday, Jackie Robinson Park felt like one of the world's top tennis academies in Florida! The heat and sunshine made for perfect tennis weather, said Michele, the Jackie Robinson Tennis Club Site Leader. The students continued to work on the basic fundamentals of the forehand and backhand. Additionally, they were introduced to some more sophisticated aspects of the forehand volley. Class was divided into five rotational stations: forehand groundstrokes, backhand groundstrokes, volleys, footwork, and hand-eye coordination. After the rotation was complete, the staff and volunteers conducted a brief tennis demonstration for the kids. Michele knew that the sight of experienced tennis players rallying back and forth would inspire her students. She wanted them imagine what they could become if they continued to work hard. The students were really engaged and entertained the entire time. Before the end-of-class game, Christine, the Educational Coordinator, conducted an off-court discussion about cognitive thinking. She emphasized the importance of taking a moment to reflect on the choices we are about to make before we actually make them. Then, one of the site's volunteers, Louis, was interviewed in the "Hot Seat." Louis shared interesting details about his background and the kids asked some really insightful questions. The team ended the session with a quick round of tennis baseball, also known as Breakout, which is always so much fun! Jackie Robinson continues to grow beautifully and, as always, Michele, Christine, and the volunteers are thrilled to be a part of such an incredible experience.